Editor’s update on June 21, 2017: Many thanks to photographer Leah Hennel for her take—in photos and words —on the Kamloopa Powwow, which takes place this year August 2-4. 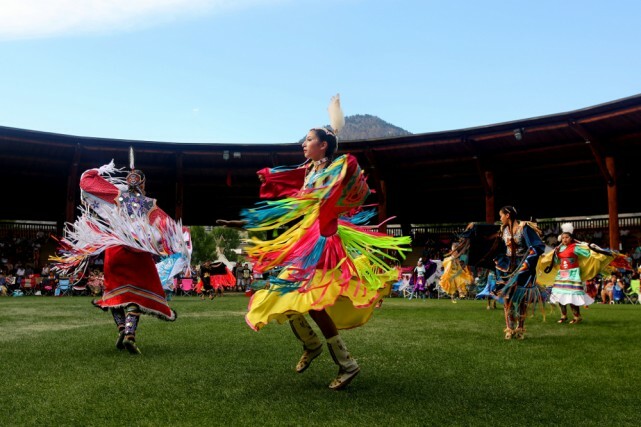 This annual celebration of First Nations culture, which draws an estimated 20,000 people from around the continent, takes place on the Secwepemc Powwow Grounds along the South Thompson River in Kamloops, British Columbia. The regalia worn by competitors—according to our correspondent on the ground—is alone worth the price of admission. 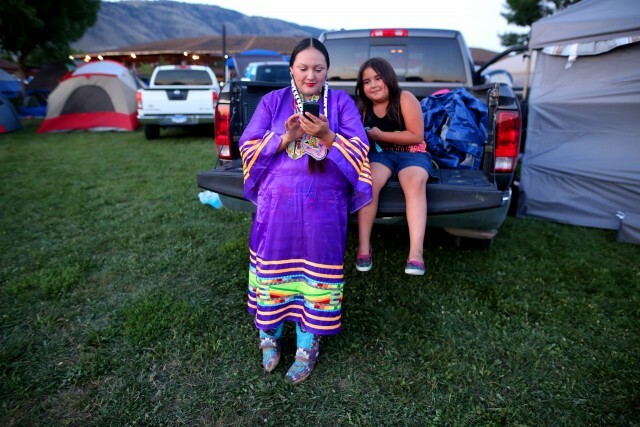 People travel from all over to attend the Kamloopa Powwow which goes day and night and into the wee hours of morning, even in relentless heat. Despite their varied points of origin, there’s a really strong sense of community here. Which is a good thing, because tents and campers are crammed in. 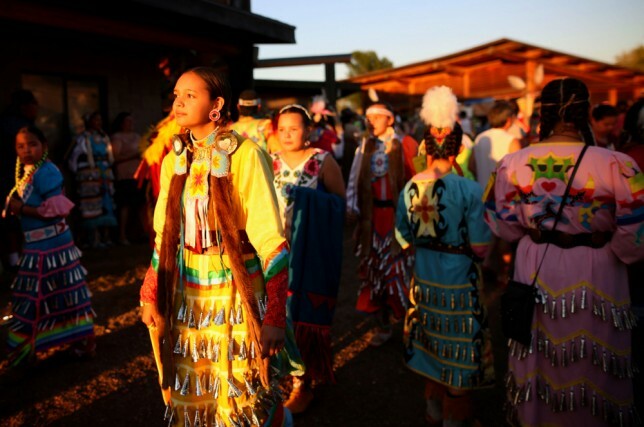 For many people, The Powwow Trail (a summer powwow circuit) goes all summer long. I was surprised at how far people travel to get to the Kamloopa Powwow. They come from places like Alaska, South Dakota, Florida, Ontario and Saskatchewan. Stephanie Wuttunee and her daughter Redsky (above) are part of the Cree band from Red Pheasant, Saskatchewan. Redsky competes in the fancy and jingle dancing categories. 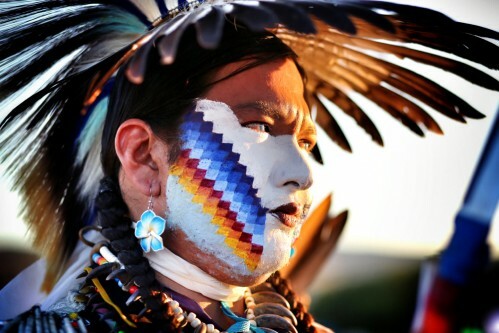 Ronn Eagle Chasing, resplendent in a buffalo-dreamer headdress, is a member of the Lakota band from South Dakota. 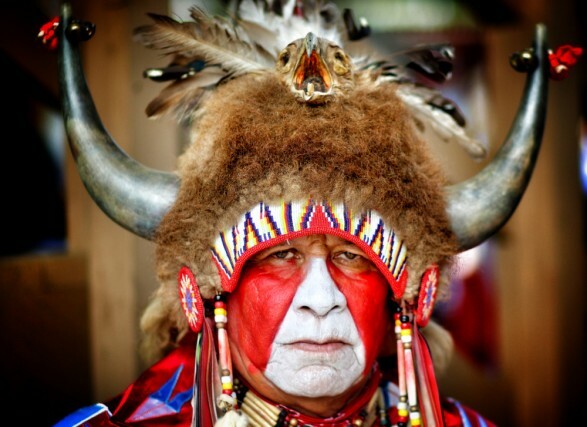 The 68-year-old competes in the powwow’s golden age category. This image reminds me of historic photos taken by Edward S. Curtis, who shot many black-and-white portraits of First Nations people in North America at the beginning of the 20th century. Some of the powwows I’ve covered have taken place inside buildings. I love that at the Kamloopa Powwow, the amphitheatre is open to the sky. It’s quite a spectacle. You’ve got that late evening light streaming in, the sound of dancers rustling in the wind, the beat of the drums in the background and then the crowd, too, cheering on the contestants. It’s pretty high-energy. Hands down, meeting people is the highlight of the powwow for me. Everyone is very approachable, even though I am basically springing up in front of them with my camera. Here Cameron Lindley, 5, left, and her sister Arianna, 6, (behind her)—who are from the Okanagan Band—endure some anxious moments before competing in the powwow’s tiny tots category. No matter what their age, competitors take what they’re doing very seriously. 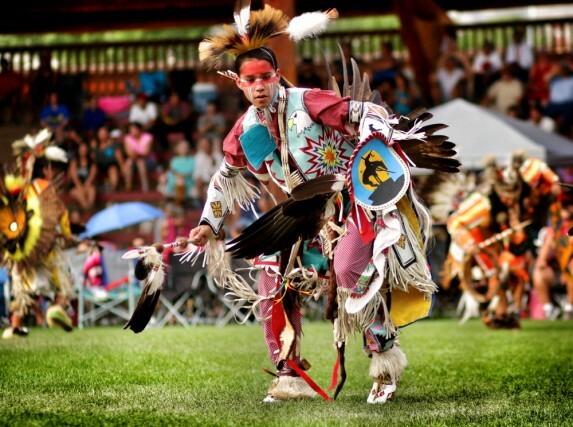 The action—the dancing and drumming at the Kamloopa Powwow— is nonstop. 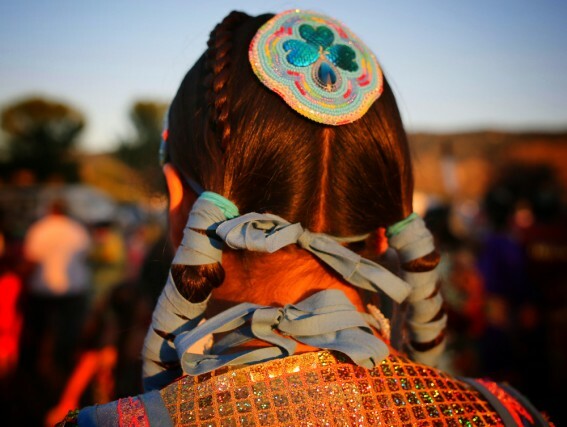 Here, Piita Manyfeathers competes in teen traditional dance. The 16-year-old, whose first name means Eagle, is a member of the Kainai Nation of southern Alberta and his costume features an eagle theme. To see a short video clip I shot during one of the women’s dance competitions, check out this link on Instagram. I like photographing the in-between moments at events, the stuff behind the scenes. Given the ’round-the-clock nature of the Kamloopa Powwow, I’m able to shoot in a variety of light situations. Nothing beats the golden hour, right before sunset, when a soft light casts a gilded glow on everything it touches. Here, a trio of teen traditional dancers chat during a break between performances. In this photo, Katherine Vielle applies make-up before the women’s traditional dance competition. Vielle is a member of the Blood tribe from Southern Alberta. For those planning to attend this event as an observer, I encourage you to get in there, mingle with people and make conversation. Don’t just be a tourist. Everyone has a story to tell. When I ask one participant why she dances, she explains she grew up in residential school and her culture was taken from her. 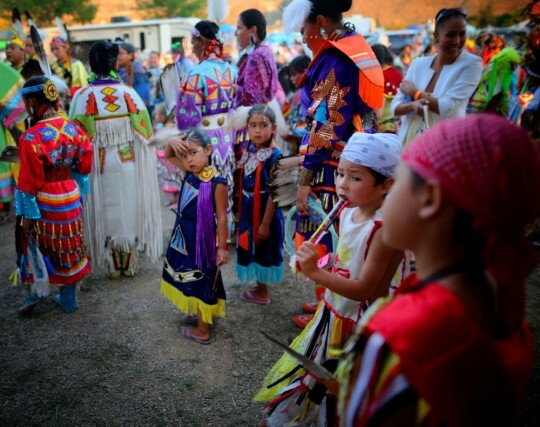 The powwow is a way to rediscover her cultural roots, which she is now passing down to her daughter. People-watching at the Kamloopa Powwow is tremendous. 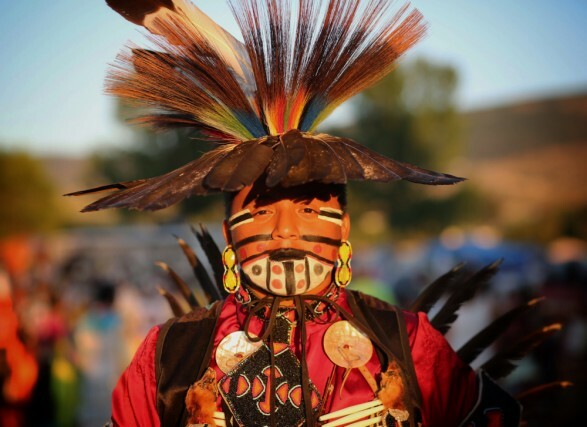 Regalia, which is worn among participants with great pride, includes everything from ceremonial feathers to beadwork to horse hair and antlers, even animal hides and eagle skulls. Here, I’ve captured a portrait of Josh Bear, a member of the Cree band in Onion Lake, Saskatchewan. Josh competes in the men’s traditional dance category. He’s also the father of River Bear, the young boy in the lead image for this post. 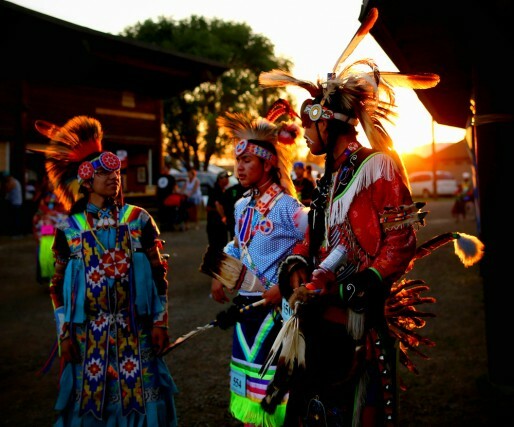 There is so much, visually, to soak up during the Kamloopa Powwow. I was quite taken with the intricate beadwork and the braids worn by First Nations women. It’s eye candy for a photographer, something you don’t see every day, even if you go to the reserves. Many women do the beadwork themselves. Ethan Sheenapatrick, a member of the Lower Nicola Indian Band of Merritt, B.C., competes in the teen traditional event. The 15-year-old says he’s been dancing “since I’ve been walking.” The teen’s dramatic regalia really caught my eye. Jingle dancers stand in the sunshine outside the amphitheatre awaiting competition. Every time they walk or move, you hear their dresses chime. I like watching them dance, but I love seeing them here, behind the scenes, getting ready. 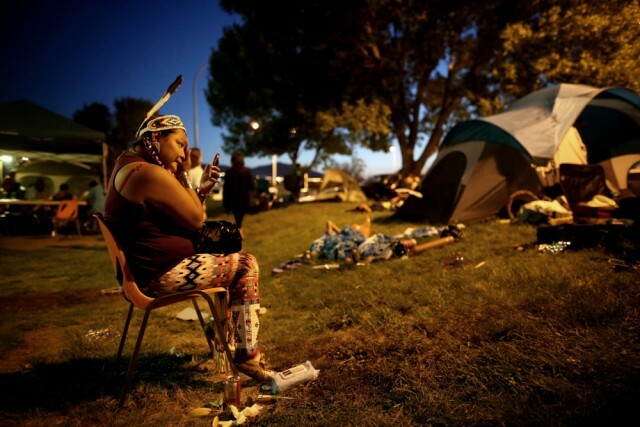 I attend three powwows this summer and meet a lot of the same people at these events. Some of the competitors think I am doing the whole powwow trail. I wish I was! 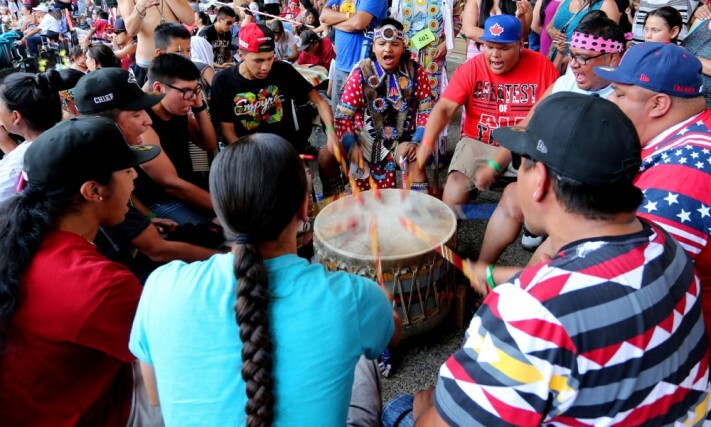 Wild Rose, a drumming group from Yakima, Washington, sings during the powwow. I feel privileged that they let me take their photos, that they let this stranger into their lives to witness a part of their culture I normally wouldn’t see. They are patient with me, always taking the time to answer whatever questions I have. Non-aboriginal Canadians have a lot to learn about First Nations history and culture. The Kamloopa Powwow offers a great starting point for conversation, and for real exchanges between people of all backgrounds. ***Note to reader: This region of British Columbia, Canada, is home to several First Nations-run destinations. To learn more, feel free to explore here. A warm thanks to our partners at Aboriginal Tourism BC, the Kamloopa Powwow and Quaaout Lodge for helping make this story happen. This story was not reviewed or edited by our partners before publication. For more Toque & Canoe coverage of aboriginal culture in Canada, check out Tasting Turtle Island: Aboriginal Cuisine Goes Mainstream and A Celebration of Living Culture. I´m glad to spent a few hours at the Kamloopa Powwow. I came especially from Germany to see the Powwow. I have been at the amphitheatre in May 2013. I didn´t know what it is so I stayed outside because I thought it is a sacret ground surely. I like the Museem and the Heritage Park. 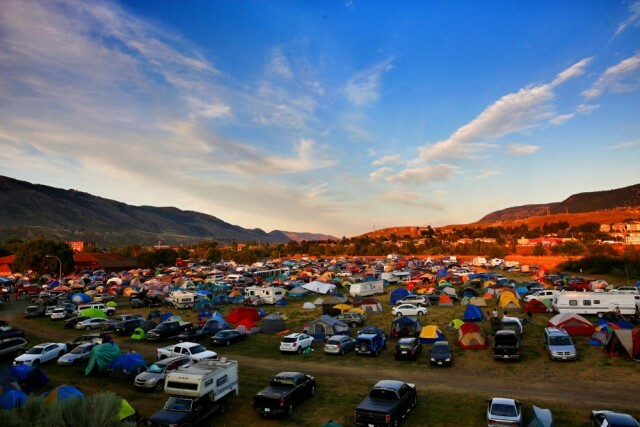 I arrived at Kamloops late at 9:00pm and fortunately got a place for my camper to stay at the reserve beside the amphitheatre. Pitifully had to continue my trip next day and could not see the Grand Entry but still had a look around the danceground. It was an awesome experience and I had nice conversations with the people I met there.